ATLANTA, GA – MELT (www.meltatl.com), the Atlanta-based sports and entertainment marketing firm, announced today it has been named sports marketing agency of record for Thompson Tractor Company, the Caterpillar dealer for the state of Alabama and ten counties in Northwest Florida. In their debut work for Thompson Tractor, MELT and Thompson Tractor Chief Marketing Officer Brian Doud negotiated what is believed to be a first-ever endorsement deal for a university strength and conditioning coach. “Dig Deep” will be the rallying cry during Alabama home games as Coach Cochran encourages Alabama fans via jumbotron and stadium ribbons in critical game situations. “Dig Deep” digital shorts, radio spots and print ads will also have the tag line promoting Thompson Tractor’s CAT equipment in Alabama and Northwest Florida. The promotion also includes an opportunity to win tickets to the Iron Bowl on November 28th against Auburn University. 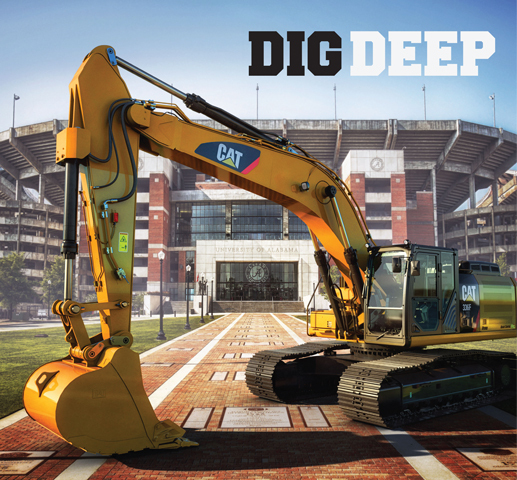 Thompson Tractor is also a sponsor of Auburn football and Auburn-themed “Dig Deep” will also be featured in digital shorts, radio spots and print ads. “We are proud to be working with Thompson Tractor and their new relationship with Coach Cochran,” said MELT CEO Vince Thompson. “Both Alabama and Auburn football resonate so well with many of our key constituencies and audiences,” said Thompson.